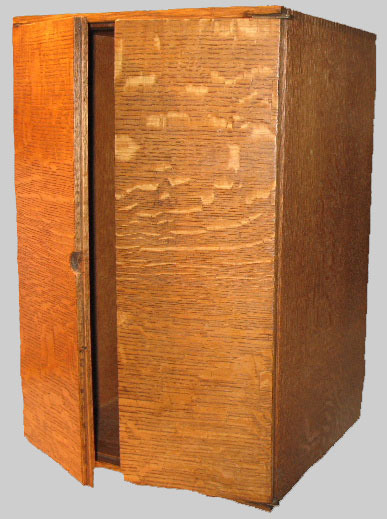 Measuring 20" high x 13" wide x 11" deep and weighing over 12lbs, this wall mount medicine cabinet is made entirely of Titanic wreckwood. This particular piece is one of just few of the larger items made from salvaged wood and has never been seen by the public. It is made of quarter-cut "English" white tiger oak, the type used exclusively in Titanic's first class public areas such as the fore and aft grand staircases. The wood it is made of matches the same type of wood that was used to make the large cabinet on display at the Branson Titanic museum which was made from sections of Titanic's wheelhouse door. It was part of the wreckage picked up by crew members of the cable ship Minia while on body recovery operations. 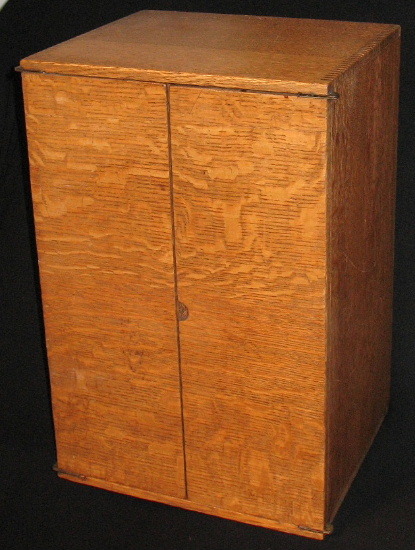 This cabinet, like many wreckwood items, was made by William Parker for Chief Officer James Adams. It was a gift from Adams to his good friend Captain A.V. Earle of New Brunswick, Canada. It stayed with his family until the end of the 20th century, where it was acquired by a well known expert Titanic researcher and collector.